Commissioners on Monday authorized County Facilities Director Jon Melvin to advertise the historic Delaware County Jail for sale. The old Queen Anne-style building is currently the home of the county’s law library, but commissioners said it can be moved if the county sells the property. 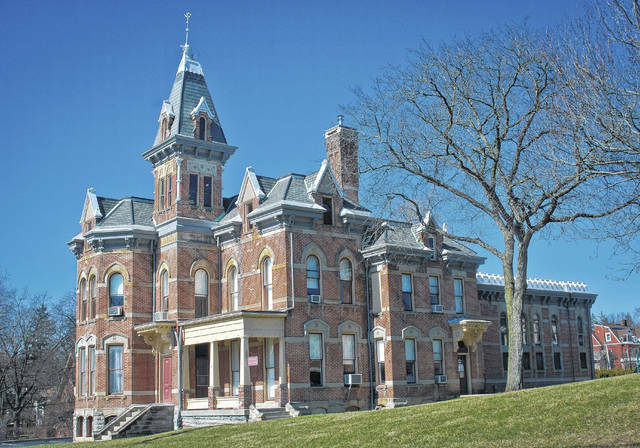 Delaware County Commissioners on Monday authorized Jon Melvin, facilities director, to publish a legal notice putting the historic Delaware County Jail and former sheriff’s residence up for sale. Melvin said the county did not set a minimum price because the board of commissioners has the right to reject all bids. Commissioner Jeff Benton was more optimistic about the interest the property will bring once it’s learned that it’s up for sale. Benton suggested using some of the “tools” of the Delaware County Finance Authority to assist in the sale of the property. “That might be the next step if we get no bids this time, but we’re also not limited to this is it,” Melvin said. Commissioner Gary Merrell said the selling of the old county jail is a conversation that did come up during the commissioners’ joint session Feb. 15 with the City of Delaware. He told city officials in that meeting that the county’s law library is currently housed in the old jail, but if the county no longer owned the property, it could be moved elsewhere. According to the National Archives Catalog, the building was placed on the National Register of Historic Places on June 12, 1990. The Queen Anne-style building was constructed in 1878 at a cost of $25,845 and designed by architect David W. Gibbs of Toledo. It was the third Delaware County jail constructed. The first jail was a 12-by-24 log cabin built in 1814, and a second jail was constructed in 1850. This entry was tagged Benton, D. Anthony Botkin, Delaware County Historic Jail, Merrell. Bookmark the permalink.